The Biological Services Center is a complete workstation in the biology lab, especially for messy, odorous projects. Exhaust ventilation, gas, air, germidical lamps, water and slanted rinse-away counter make it ideal for many experiments that don’t fit anywhere else. 56″ L. X 33″ W. X 74″ H. Overall. Fluorescent (32 watt) lighting, duplex electrical outlet and protected germicidal lamp are incorporated in the top. Control panel contains master circuit breaker and switches for exhaust blower, germicidal lamps and light. Black color one-piece rinseaway sink is made of reagent resistant, fire-retardant fiberglass reinforced polyester material with raised edges, rounded corners and integral sink with outlet and stopper. Top is formed so all points drain to outlet. One pull-out shelf provides surface for microscope or balance. 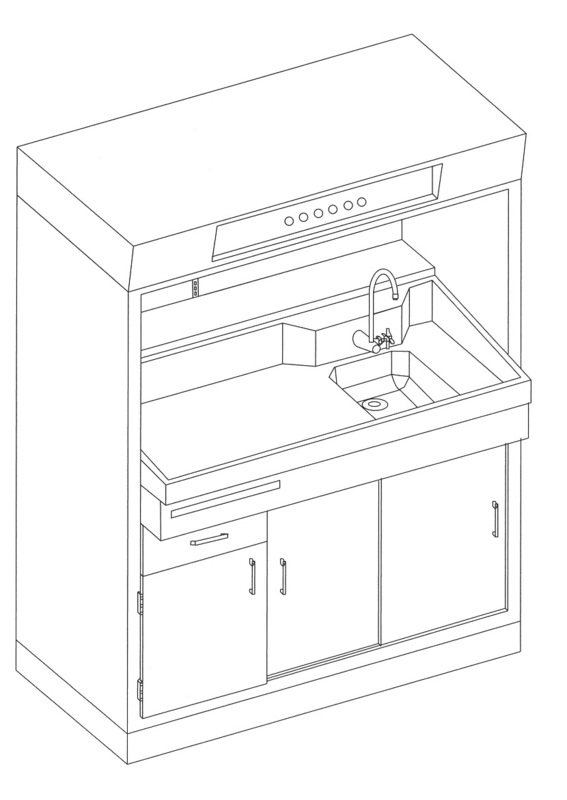 One drawer offers space for books, worksheet, utensils; one cupboard with removable waste bin; double door cupboard; one adjustable glass shelf. Back ledge is Shelresin, runs full length of interior and is 8″ wide for storage of beakers and flasks. Blower located in superstructure provides approximately 40 lineal feet exhaust velocity through face opening, more than enough to vent odors and smoke to the outdoors.